NTP is a UDP-based protocol that is frequently set up in an unsafe manner, allowing attackers to use NTP servers to amplify DoS attacks. You should see a line like this, indicating that port UDP 123 is open, as shown below. You should four "transmit" messages and four "receive" messages, followed by a lot of timestamp values, as shown below. This shows that your NTP server is operating correctly, allowing another machine to synchronize its clock from it. You see a "***Request timed out" message, as shown below. This is because the attacker is not allowed to execute that operation. This is one way to make your NTP server vulnerable, allowing everyone to use every operation. Obviously this is a terrible idea, but there are thousands of NTP servers running now that allow the dangerous operation from everyone. This tells the server to allow anyone to execute any command without authentication, which is obviously a terrible idea. 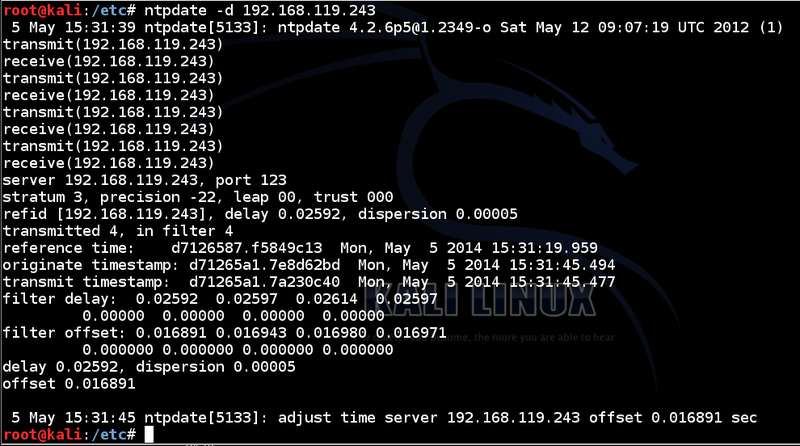 You see a reply, listing the client that has recently used the NTP server (your attack machine) as shown below. This is the essential vulnerability we will exploit--a small request gives a large response. A real NTP server will have a list of hundreds of clients, because many machines use it. In our test situation, we'll have to send false update requests to simulate that situation. Start Wireshkark listening on your eth0 interface. In the Filter box, type ntp and press Enter. In Wireshark, you should see one "NTP Version 4, client" message and one "NTP Version 4, server" message as shown below. On your Kali Linux Attacker machine, click the "NTP Version 4, client" packet so it is highlighted in the top pane of Wireshark, as shown above. 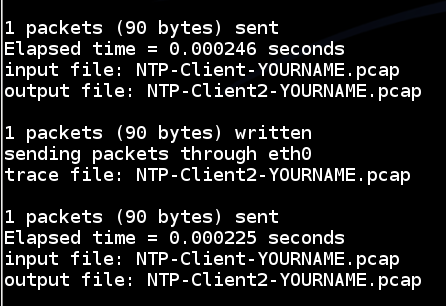 In the "Wireshark: Export Specified Packets" box, at the top, enter a name of "NTP-Client-YOURNAME.pcap". On your Kali Linux Attacker machine, close Wireshark. You may have already done this in a previous project. If not, do the steps below. Using bittwiste, we will change the source IP address of the SNMP Request packet to a different IP address. You should see a list of addresses, now including the fake address "1.2.3.4", as shown below. You see a lot of messages, as the pcap file is repeatedly edited and transmitted, as shown below. You may have to repeat the command twice, but when it works, you should see a long list of addresses starting with "2.2", as shown below. Make sure your screen shows a lot of addresses starting with "2.2". Save the image with the filename "Your Name Proj 6xa". Use your real name, not the literal text "Your Name". 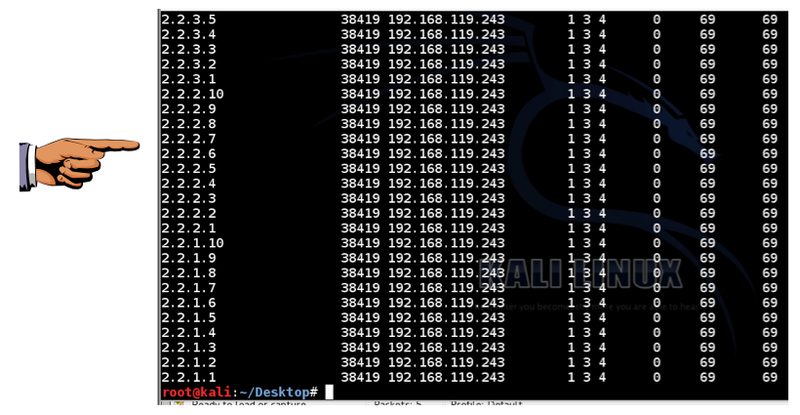 On your Kali Linux Attacker machine, start Wireshark sniffing on your network adapter. In Wireshark, stop the capture. You should see a single packet sent to the server, with a long list of reply packets. Right-click one of the NTP packets and click "Follow UDP Stream", as shown below. 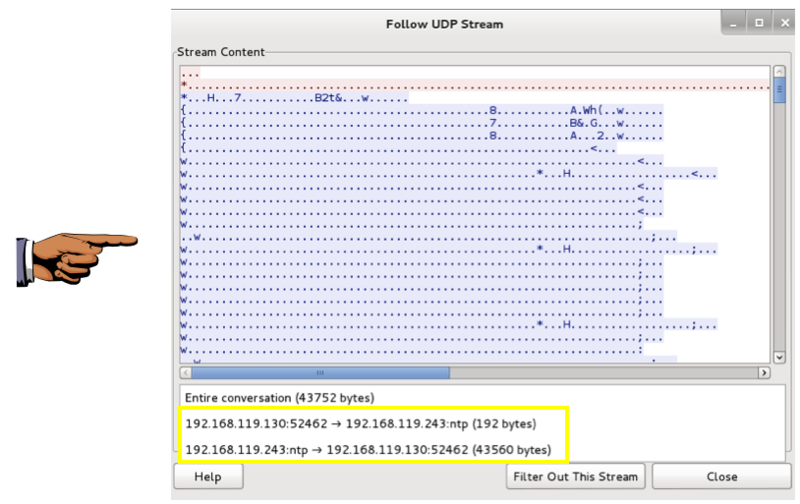 In the "Follow UDP Stream" box, at the bottom, click the double-arrow to the right of the "Entire conversation" message. The sizes of the request and response streams are shown. When I did it, the request was 192 bytes and the response was 43,560 bytes, as shown below. That's an amplification of 43,560 / 192 = 226.9x! Make sure your screen shows the sizes of the two UDP streams, as shown above, and that the second stream is much larger than the first one--more than 100 times larger. Save the image with the filename "Your Name Proj 6xb". Use your real name, not the literal text "Your Name". In the "Follow UDP Stream" box, at the bottom, click Close. In Wireshark, in the top pane, make sure the first UDP packet is highlighted, the one sent to your NTP server, as shown below. 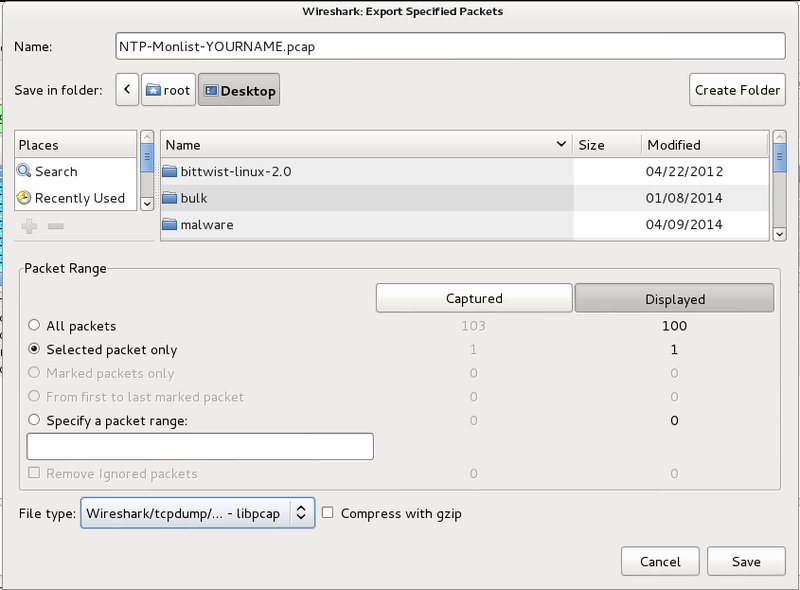 In the "Wireshark: Export Specified Packets" box, at the top, enter a name of "NTP-Monlist-YOURNAME.pcap". Using bittwiste, we will change the source IP address of the SNMP Request packet to the Target Windows 7 machine's IP address. When the command succeeds, you should see the message "1 packets (234 bytes) written". 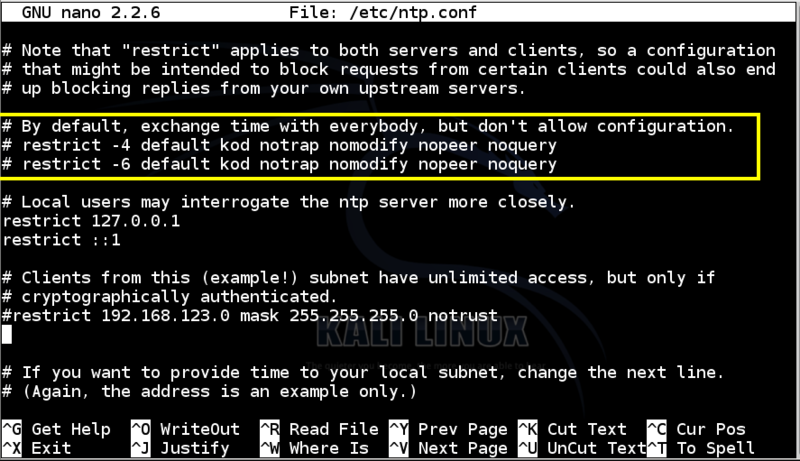 This sends an endless flood of SNMP requests to the Kali Linux NTP Server, which reflect and amplify, attacking the Windows 7 target. 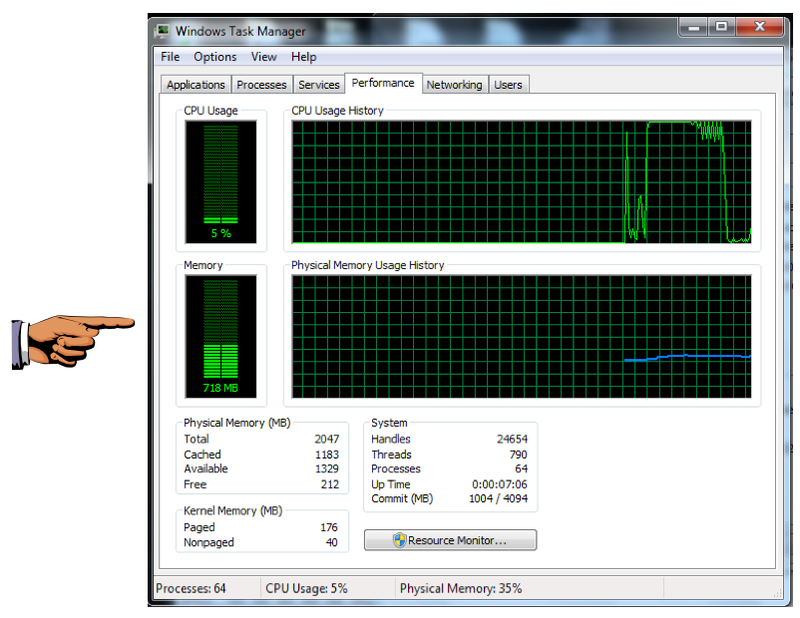 You should see the CPU increase, as shown below. 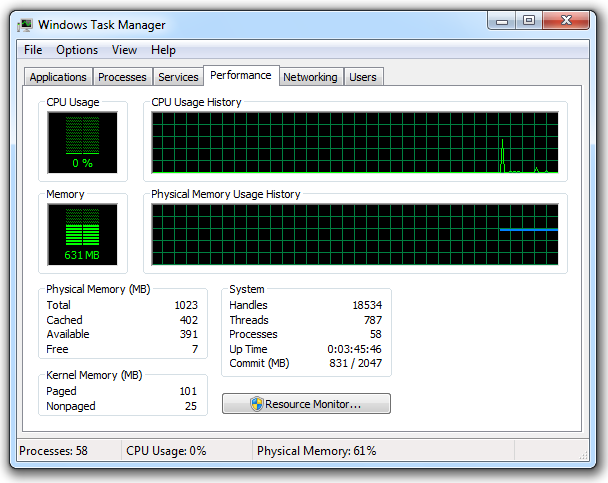 On my system I was easily able to push the target to 100% CPU, as shown below. Save the image with the filename "Your Name Proj 6xc". Use your real name, not the literal text "Your Name". Send it to: cnit.124@gmail.com with a subject line of "Proj 6x From Your Name", replacing "Your Name" with your own first and last name.